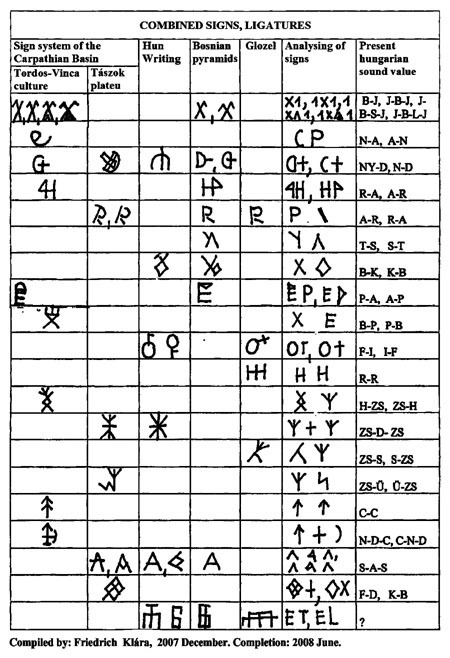 We have been studying and researching the signs of ROVÁS for 30 years and use the Hungarian word ROVÁS (ingravings) instead of runic writing, because the two are not the same. We lecture here on our experiences on the Visoko pyramids, after having visited the site a couple of times. We have realised the similarity between the signs of the 8000 years old Neolithic Tordos – Vinca Cultur and that of the Bosnian Valley of the Pyramids. The oldest relics revealed until now are the signs originating from a 15-20,000 years old undisturbed layer on a piece of bone stick in Jankovich cave in Bajót, North to Budapest in Pilis Mountain. 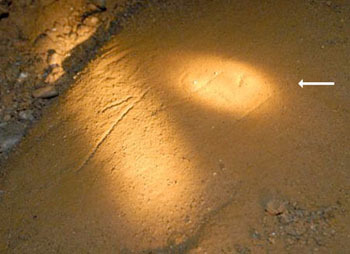 Above Piece of bone stick in Jankovich cave and Unharmed megalit exhibited in the Museum in Gyergyószentmiklós. Signs on megalits on Tászok-tető (Taszok-plateau) Tászok-tető can be found in the Carpathian Basin in Transylvania. Descriptions say that on the 1013 m high plateau and in the surroundings there were several hundreds of written stones, with an average size of one and a half meter. Two unharmed megalits are exhibited in the Museum in Gyergyószentmiklós (Transylvania -Seklerland). There are great many broken stones still laying around on the plateau. We controlled it personally. Based upon the parallels all through the world it can be stated that the majority of the scripts on the stones is about 10,000 years old. Above ROVÁS R+A ligature in Pilis Mountain and ROVÁS R+A ligature in Visoko at the entrance of the Ravne tunnel. 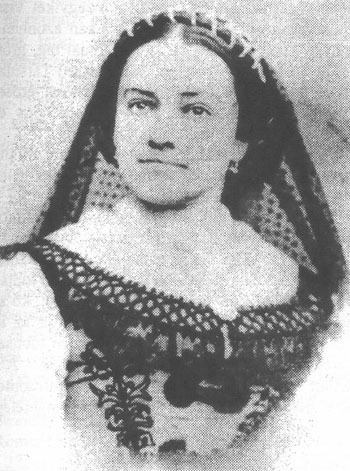 The Tordos (Turdas) culture in Transylvania was excavated by the very first female archeologist of the world, the Hungarian Zsófia Torma. From 1875 she unearthed thousands of clay discs, tablets, artifacts deriving from the Neolithic period. 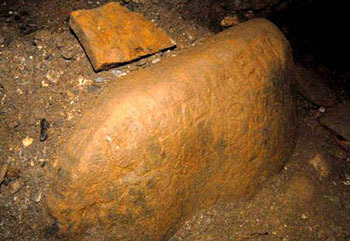 Most of the signs on these relics equal to those of the ancient Hungarian ROVÁS script used even today. By her excavation near Tordos (Turdas) she has found some 11,000 articfacts about 7,000 years old several of them wearing ROVÁS signs. 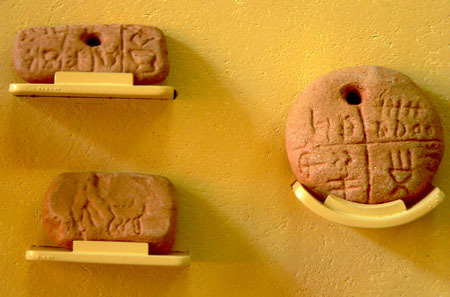 They can be seen in the History of Transylvania Museum in Kolozsvár (Cluj). 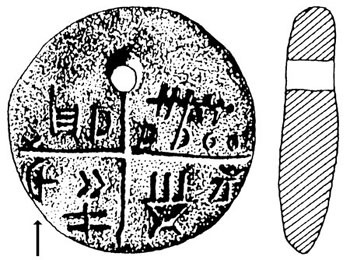 Above Artifacts of Zsófia Torma in the History of Transylvania Museum and The symbols on the Tatárlaka (Tartaria) Disc, discovered in 1961, 7500-8200 years old. Because the disc and two clay tablets have been found in a grave with some organic remains like bones and ashes, they could have been tested with C14 radiocarbon by professor Suess at the university in San Diego. 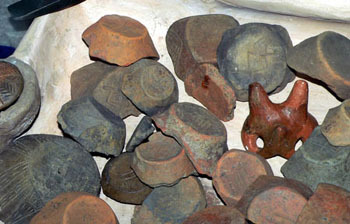 In Vinca, a settlement in the vicinity of Beograd, Serbia, and in the surroundings plenty of objects from the Neolithic were revealed as well, from 1905. The map of Lithuanian archeologist Marija Gimbutas shows the spreading of Tordos (Turdas) -Vinca Culture. 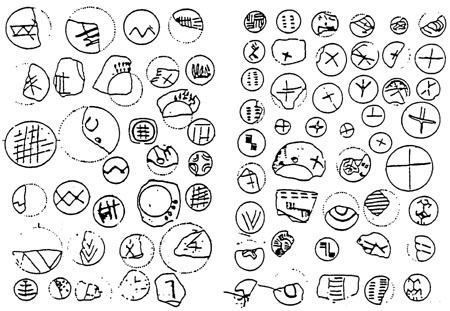 Above The map of Tordos (Turdas) – Vinca Culture and signs on clay potteries from Jela Sabac in Serbia. Hun writing : The Chinese had written documents about the Huns as far back as 1700 BC., but we can find a great deal of information in the works of Syrian, Greek, Armenian, Iranian, and Latin historians. 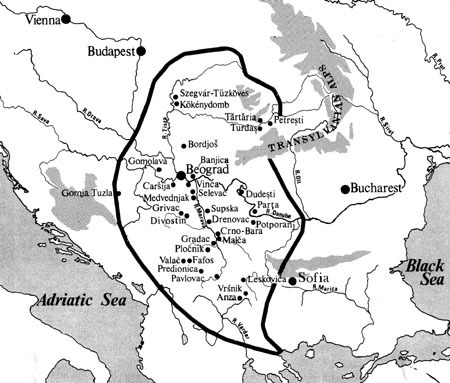 In the 4th century A.D., the Huns had moved the headquarters of their Empire into the Carpathian Basin. Our chronicles from the 12th century A. D. also mention the Hunnish-Hungarian identity. 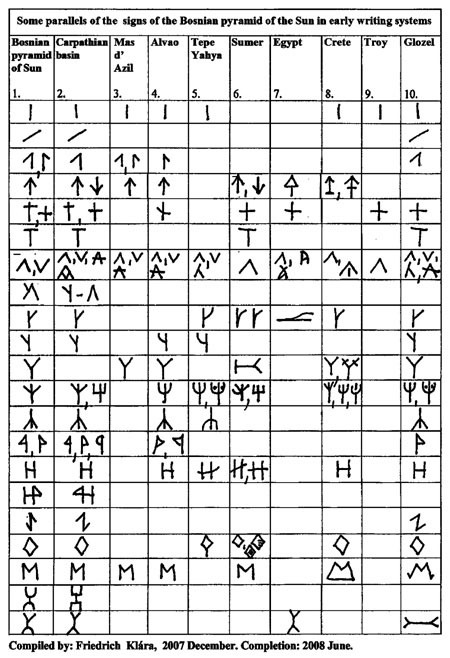 The Hunnish signs of writing underscore this relationship by showing a great deal of similarities with the Hungarian runic writing. General statement: Rovás is widespread in Hungary. 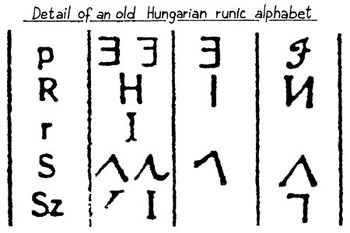 So the 15-20,000 years old signs absolutely fit to be used even in our days as well, all the more because the phonems of the Hungarian language can be put down perfectly only by this type of writing. 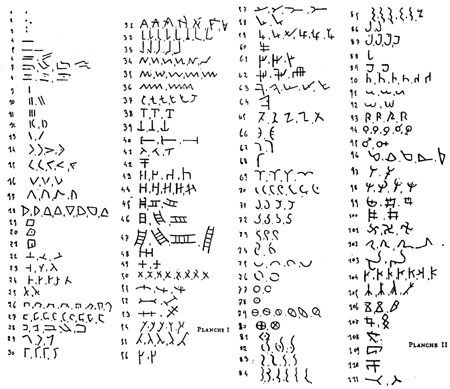 In the 10th century, when the ancient writing of the Hungarians had to be replaced by Latin letters, 13 phonemes of their language – TY, GY, NY, SZ, ZS, CS, LY, J, K, Á, É, Ö, Ü – were missing from the Latin alphabet. Signs of the Bosnian pyramids: I visited Visoko for the first time in Summer of 2006. My eyes were caught by one of the tableau photos, put on display on the plateau of Visocica – Sun piramyd. The photo depicted an arrow sign on stone. I noticed that the edges of the arrow-head were not ended in one point. 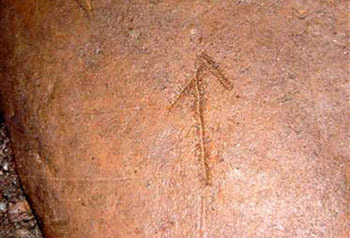 For me the arrow sign was not unknown, because it’s the sign of C in the ancient Hungarian ROVÁS. But in this case it’s ligature of two J’s or J and C. See rod calendar from XII-XIII. c. AD. Transylvania (Pict-21). The same year I visited the tunnel two times more, when I made other schocking discoveries. On the stone with the arrow I have found something even more special: the sign of a streched bow with an arrow on it that can be seen on the before mentioned Tartaria clay tablet, too (Pict-22, Pict-23) showing the ligature of ROVÁS D-Ny. 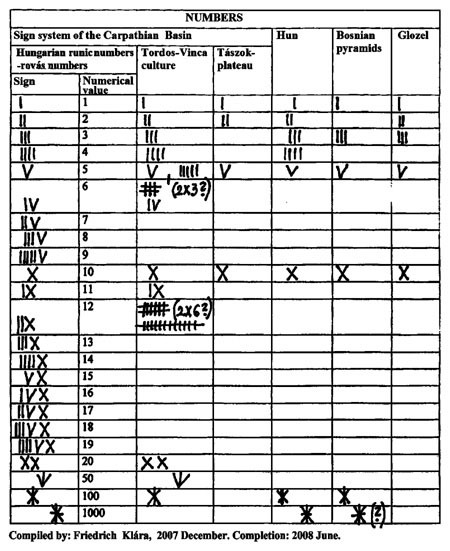 See rod calendar from XII.-XIII. c. AD. Transylvania. Having seen the resemblance Friedrich Klára has immediatelly made comparetive charts and coupled with explanation and photo of the stretched bow with arrow. In the Ravne tunnel there are great many signs and symbols supposed to be Latin letters. 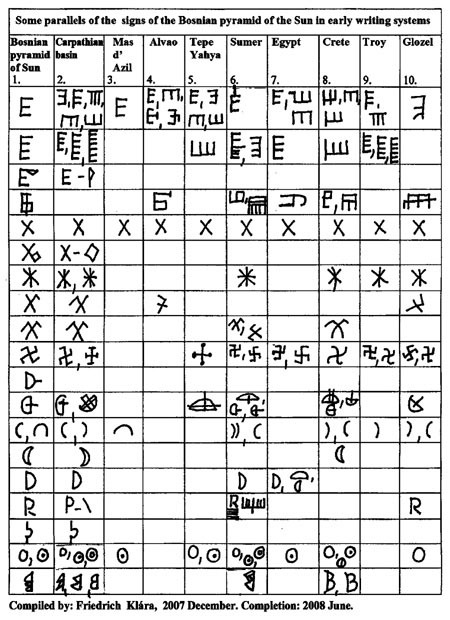 Many of them Friedrich Klára identified with letters of the ancient Tordos – Vinca Culture, among others Hugarian ROVÁS. 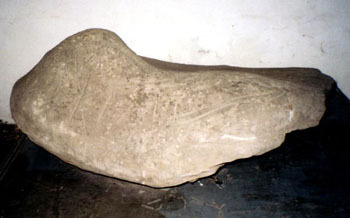 For example capital E identical ROVÁS ‘P’ that has been found in Troy, Egypt, Tepe Yahya (Iran). Having been widely used on the territory of Tordos – Vinca Culture, these letters make us suppose that this culture comprised Visoko, too. 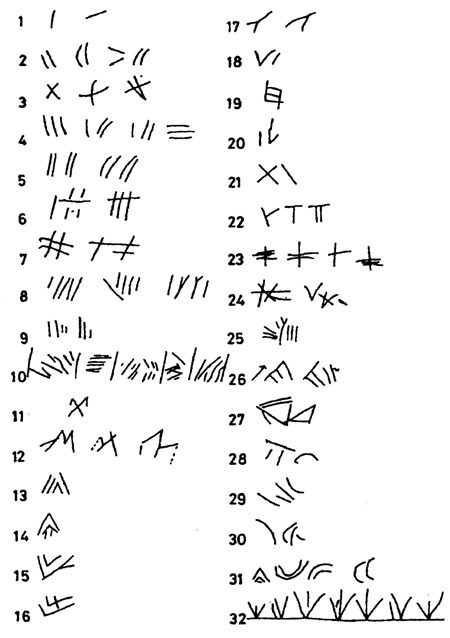 Summary: Having visited Visoko 7 times and reviewed the tables, we are entitled to suppose that in the Carpathian Basin, in the Bosnian Valley of the Pyramids, Alvao and Glozel representatives of the same culture were acting and left us their written signs. 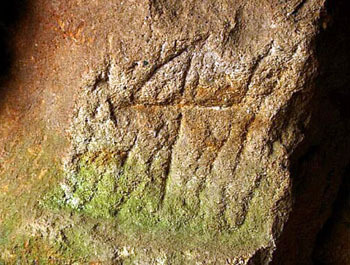 The signs of writing found on the site definitely show that man sent messages by them to the future. The first time I read about the Bosnian Pyramids was in May 2006, there was an article in the Hungarian newspaper. The article written was skeptical about the Pyramids. My husband Szakacs Gabor is a newspaper writer, and we were always interested in old history, especially the one that the official academic science looked down upon and tried to keep it quite. In June of 2006 an expedition was formed and with a photographer and camera man they visited Visoko. In the tunnel of Sun Pyramid, they found writings on the stones and Gabor verified the writings are similar to those found in the Carpathian Basin deriving from thousands of years ago. 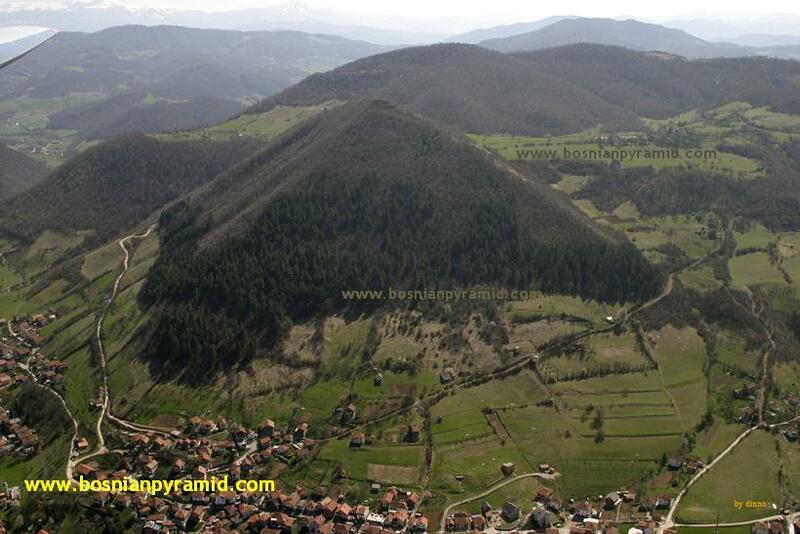 What was found is that the Bosnian Pyramids were manmade and not made from nature. Gabor returned to the Pyramids many times with his own team. He always reported his findings to the newspaper and always sent a copy in English to Semir Osmanagic. 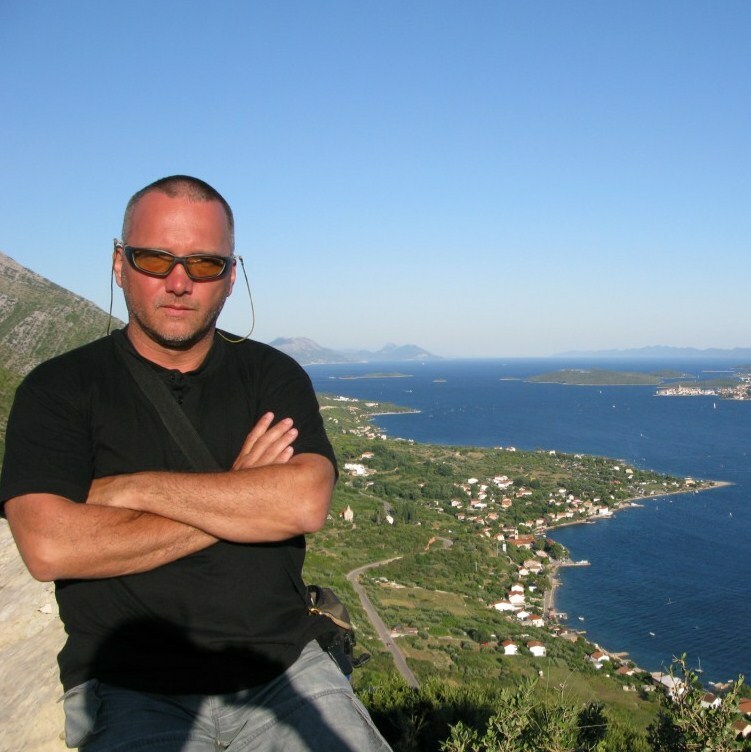 I visited Visoko in June 2007, the Bosnian landscape, the friendly and hospitable people made a good impression on me and my traveling companions. My personal visits convinced me of reports I had heard from Gabor. I am sure that the Pyramids were created by man and not by nature and are artificial structures. My theory is: The Sun and Moon Pyramids are older than the Egyptian Pyramids. Every culture on earth talks about the “Great Flood” which happened 11 or 12 thousand years ago. According to the scientists the Bosnian Pyramids are at least that age or more. The Pyramids are connected globally to Megalithic culture. Such as Stonehenge, Avebury, Hattusas, Malta, Mukene, Carnac, Taszok-Plateau (Hungary) Moonlight Rift Valley also in Hungary etc. In the tunnel of the Sun Pyramid and the perimeters you find a sign of Stone Age culture. In my opinion it is the builder’s signature on the walls. To support this theory the writings in the attic of a church that was built in 1547 in Transylvania were similar to writings found in the Sun Pyramid. 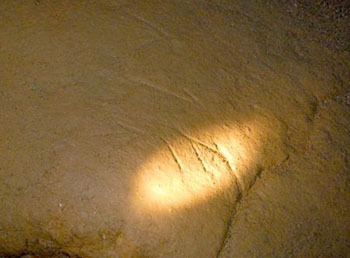 Also similar writings were found in France on the Mas-d-Azil stones over 25 thousand years ago. Other examples are Tordos-Vinca culture in the Carpathian Basin, Aegean Islands, Tepe-Yahya in Iran, writings from Troy and Egypt. I found it interesting that these writings were not chiseled into the stones; instead the writings were impressed into the stones. Formerly having studied runes that had been chiseled, the difference was easy to see. That means the stones with writing in the tunnel of Sun pyramid, were in olden times soft building material, like nowadays concrete or gypsum. Nature could not have made these stones. Because the pyramids consist of many layers of the stones suggest that the pyramids were made to withstand a catastrophe (radiation from space etc.) Some of the materials looked like they were liquid artificial material (see Pict-20). To make stones of this size you would need giant machines and giant beings. “Giants existed on the Earth at that time…” according to the Bible and are talked about in mythological stories. There were some strange things inside the Pyramids, there were no bugs, spiders, rodents and the air was good and fresh. I had a traveling companion who was coughing, after breathing the air in the pyramid for a while he stopped coughing. Another man had white spots appear on the palms of his hands while still others said their arms and legs felt heavy. But those that had strange things happen to them were not uncomfortable and the symptoms went away. I brought home a piece of cobblestone and showed it to several natural therapist whom independently from each other stated that the stone felt warm on the bottom but not on the top where people would walk. G. Harry Stine (an American scientist) who participated in the American Space Program wrote a book in 1992, called “Mind machines you can build”. The book discussed the phenomenal effects of the pyramids. We learned from him that the pyramid models were not made of any electrical conducting material; these pyramids can preserve the sharpness of steel on the leading edges of a scaled machine, dried out wet organisms, but also enhanced plants to grow faster than ever. One Czech engineer discovered that he could shave 200 times with the same blade if it was placed in a paper pyramid model. In the United States of America, Dr. Patrick Flanagan experimented with pyramid models and found that it was beneficial for living creatures. It would be interesting to try this theory out at the Bosnian Pyramids. Szakács Gábor: First visits to Bosnian pyramids. I went to Visoko for the first time in June 2006. To help document my findings I took a photographer and a cameraman from the weekly issue of Hungarian Democrat (Magyar Demokrata). We stayed at the Pyramida Sunca Motel. Not knowing anyone I had good fortune to meet Barakat, an Egyptian scientist and his friend Sanel Silajdzic. From that moment on both men helped me, as we went to the Sun Pyramid for the first time. Sanel showed me some pictures on a tableau that had been made before. One of the pictures caught my attention; it was an arrow that looked like the letter “C” which the Hungarian use in his runic alphabet. Because the lines of the bow did not meet I was suspicious about its meaning. We could not get into the tunnels at that time, but in September 2006 I had two opportunities. On one of the trips into the tunnel Sanel and I were crawling on our stomachs to get inside, about 150 meters in we filmed and photographed the writings on the walls so later we could analyze them. The work was so exciting and memorable because we found more writings on the big stones. The drawn bow with the arrow attached was crystal clear, which was an incredible find because this sign could be found from the Tordos-Vinca culture 8,200 years ago. 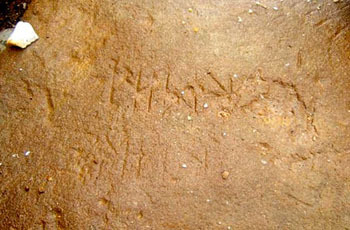 This writing was found on a clay ring in Tatárlaka (Tartaria – Transylvania), presently on display in the Cluj Historical Museum (Kolozsvár – Transylvania). On this ring the writings of the ligature letters ” NY” and “D” were clear to see. I am convinced that the Visoko Pyramids were connected to the Carpathian Basin where the Tordos-Vinca Culture lived. 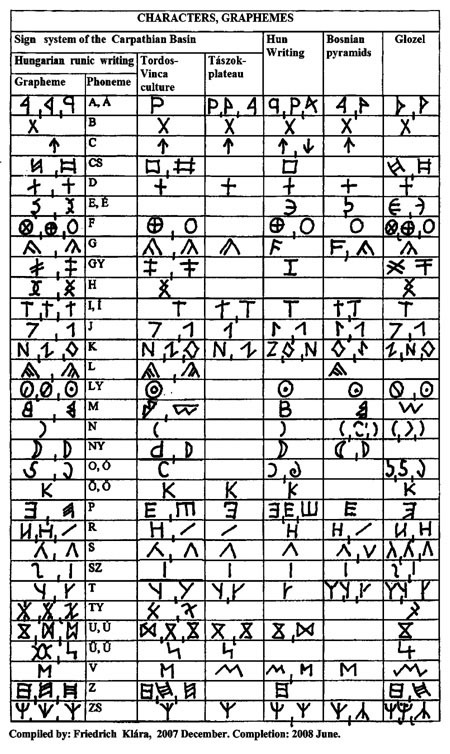 Since that trip my wife and I have been back to Visoko and identified more than 10 letters from the Hungarian runic (Rovás) alphabet. I didn’t want people to doubt me so I took over a 100 writing specialists with me to give their opinion, they all supported the earlier reports. The writings cannot be duplicated today because the writings would not look the same and the stones would crumble. 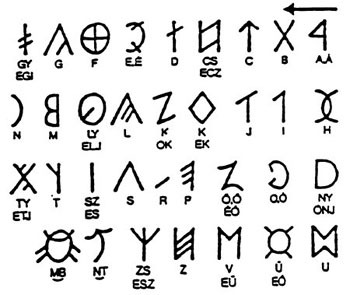 The writings have similarities with the French Glozel signs. But this was nothing new for my wife and me, because years ago we had already compared and identified those findings. To sum it all up the Tatárlaka ligature sign (Pict-22, Pict-23) was the biggest discovery, which was found in the Sun Pyramid. With this discovery and reports it would take a book to explain. This entry was posted in *****, Old Europe and tagged Alvao, Glozel, Hun Writing, Marija Gimbutas, Rovás, Turdas, Visoko. Bookmark the permalink. Thank you for this wonderful article. I am intrigued by the work of Friedrich Klara, and will follow her work closely in the future. Although hard to open (takes about 8m), this site gives a general view of Terceira Island findings (Azores). Most of the signs are similar to Bosnia ones.